"A temporary condition of altered attention in the subject which may be induced by another person and in which a variety of phenomenon may appear spontaneously or in response to other stimuli. These phenomena include alterations in consciousness and memory, increased susceptibility to suggestion, and the production in the subject of responses and ideas unfamiliar to him in his usual state of mind. Furthermore, phenomena such as anesthesia, paralysis and rigidity of muscles, and vasomotor changes can be produced and removed in the hypnotic state." "Hypnosis typically involves an introduction to the procedure during which the subject is told that suggestions for imaginative experiences will be presented. The hypnotic induction is an extended initial suggestion for using one's imagination, and may contain further elaborations of the introduction. A hypnotic procedure is used to encourage and evaluate responses to suggestions. 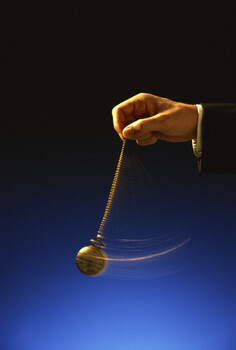 When using hypnosis, one person (the subject) is guided by another (the hypnotist) to respond to suggestions for changes in the subjective experience, alterations in perception, sensation, emotion, thought or behavior. Persons can also learn self-hypnosis, which is the act of administering hypnotic procedures on one's own. If the subject responds to hypnotic suggestions, it is generally inferred that hypnosis has been induced. Many believe that hypnotic responses and experiences are characteristic of a hypnotic state. While some think that it is not necessary to use the word "hypnosis" as part of a hypnotic induction, others view it as essential." The precise hypnotic procedures and nature of suggestions will differ depending on the goals of the practitioner and the purposes of the clinical endeavor. Hypnotic processes traditionally make use of suggestions to relax, although relaxation is not absolutely necessary for hypnosis and some suggestions can make the patient more alert. Suggestions that permit the extent of hypnosis to be assessed by comparing responses to standardized scales can be used in both clinical and research settings. While the majority of individuals are responsive to at least some suggestions, scores on standardized scales range from high to negligible. Traditionally, scores are grouped into low, medium, and high categories. As is the case with other positively-scaled measures of psychological constructs such as attention and awareness, the salience of evidence for having achieved hypnosis increases with the individual's score."